Why Can't We Use https for Everything? - Ask Leo! Why couldn’t all websites that are genuine, like microsoft.com or hotmail.com or yahoo.com, be https? The problem is that it’s not a simple switch. Besides the technology, there are some costs and ramifications. And it may not solve all the problems you think it does. It verifies the identity of the remote site. Https uses cryptographic information called “certificates”, which allow the browser to positively confirm that the site you’re connecting to is, in fact, the site it claims to be. It encrypts the data flowing between your browser and the remote site. All the data sent is strongly encrypted such that only the recipient can decrypt it to view its contents. Verification and encryption: that’s all https really does, but those are two very important and useful things. Positively verifying a site’s identity is important because of a couple of different approaches that malicious entities sometimes use to cause problems. A “man in the middle” attack is where someone sits between you and the site you’re attempting to connect to. When your browser asks for, say, paypal.com, the interloper sends you to their fake site, which looks like paypal.com but is not. If present, https will warn you that the security certificate is somehow incorrect for the site you finally reach. “DNS poisoning” operates similarly. DNS is the system that maps domain names – like “paypal.com” – to the IP address of the physical servers that house the associated web site. DNS poisoning inserts incorrect information, once again routing you to a fake site instead of your intended destination. Https would again warn you that the site’s security information is incorrect. Data transferred between a web browser and web site over an https connection is strongly encrypted. That means no one listening in on the conversation can understand it. All internet traffic travels across multiple devices, and while the vast majority are trustworthy, there’s actually nothing preventing any of them from listening in as described. Https ensures your communications are private, no matter what path they take. The most common admonition for https comes when using open Wi-Fi hotspots, such as those found in coffee shops and other public places. When using open Wi-Fi, anyone within range can listen in to the data flowing between your wireless device and the wireless access point. Once again, https ensures that your conversations are private. It’s our own fault – and by “our own”, I mean the fault of website owners, myself included. We’ve misused https, or allowed errors to happen often enough, such that people have been “trained” to ignore those errors when they encounter them, and proceed to our sites anyway. Because setting up https takes effort and money, there are free alternatives. The most common example is a “self-signed certificate”. Since it’s free, there is no vetting process; anyone can create one themselves. As a result, such a certificate does not prove the identity of the site you are connecting to, but does encrypt your connection. It’s fine when encryption is all you need. However, most browsers will display an error of some sort when accessing a site using a self-signed certificate. To proceed, you must ignore or bypass the error. As you can see, there are several scenarios in which ignoring the error is the recommended course of action. The result is that, having been “trained” that sometimes it’s OK to do so, it’s now too easy to accidentally ignore an error when you shouldn’t. The link looks perfectly safe. The link does not go to where it says it does. The destination does not use https. There is no resulting https error. If the landing site looks like microsoft.com, but is not microsoft.com, many people will never notice the difference. This is just one way that phishing attempts work. By tricking you into thinking you’re going to a safe and secure site, which matches your expectations when you arrive, phishers can get you to enter your security credentials and more, and then they can log in into your account. And https? The fact that the real microsoft.com might use https is completely irrelevant, since that connection was never even attempted. You were sent to a completely unrelated site. As you might expect, web sites that request sensitive information from you should be https. Banking sites, as just one example, should always have an https connection to enforce both identity verification (you really are connected to your bank), and data encryption (no one “listening in” will be able to see your information). 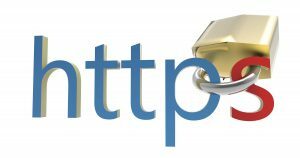 What’s not as obvious is that https technology can add value even to sites like Ask Leo! For example, because the connection is encrypted, no one “listening in” could see what kinds of things you’re searching for when you visit the site. The terms you search on specific sites, and on Google in general, have been shown to be a relatively effective way of identifying not just who you are, but what your concerns, issues, and activities might involve. If you’re about to take a download from a site that provides downloads, https ensures you’re connected to the site you think you are. This prevents a man-in-the-middle attacker from substituting his own malware-laden version of whatever it is you’re downloading. As an additional way to help improve your privacy, as well as secure your connection, https to just about any site can, indeed, make sense. There’s a cost to website owners for https to be done properly. The site owner needs to purchase an https certificate. Much like domain registration, this is an ongoing annual cost. Purchasing a certificate also requires that the owner prove his or her ownership of the site and provide a certain amount of information about themselves. Https certificate cost has been coming down in recent years, and basic validation can be as inexpensive as domain registration itself. Extended validation – the more secure form of https used by banks and other highly sensitive sites – costs a fair amount more, because it requires checking a fair amount more about the site and its owner. The other “cost” is the intangible one: by its nature, setting up https is somewhat technical, a tad finicky, and can be time consuming, especially if it’s something you do only once every few years. One of the classic objections to using https is performance. The concern is that the overhead of encrypting all the data would affect both the web server and the client browser. That’s simply no longer true. Current computers have more than enough computational power to make encryption work negligible. In addition, while the initial connection set up involves computationally expensive cryptography, once established, the vast majority of data transmitted is actually encrypted using a relatively simple cipher. From what I understand about https and signed certificates, that transactions are as about as secure as they can get. So can you please explain to me what is the purpose of PayPal when the above mentioned securities are in place? I really resent PayPal as the only option to pay (or give) on a website, and I have not read good things about them at all. Right now my master gardening group is encouraging us to pay with check because paying online uses PayPal, and they take a few dollars every transaction! Since we are pretty much self-funding, self-supporting, non-profit, I resent it. The thing to understand about Paypal is that it is a very easy solution for the small business or non-profit. Setting up a secure website correctly is very difficult and expensive – it is out of reach for the little guy. Paypal makes the setup so easy that practically anyone can do it. Along with their ease is their top security. I don’t know what you hear about Paypal, but they have a great history of security. Of course Paypal takes a fee. All credit card merchant solutions do. Plus I always pay with a debit card, not a charge card. So once again, what is the purpose of PayPay “stepping” in to grab a few dollars under the guise of “protecting” me, when they are doing nothing of the sort! How about this sample because I do a lot of business on the internet I have been caught a couple of times once for a debit card transaction for about $500 dollars it took numerous emails and a couple of months for the bank to finally fix it up and return my money. Another time I was caught in a similar incident when using Paypal I wont go into all the details but the amount ended up over $1000 I rang paypal and after around 15 minutes on the phone sorting it out the money was back in my account within 30 minutes. I also like the idea that I get an SMS to confirm any payment from my account. unlike a bank where you have no idea until you get your statement. Personallythese days I will not do any business on the internet unless I can use Paypal. Second, the “protection” they are offering the buyer is that the seller never gets your credit/debit card information. That may be so, but Chrome is warning me that, “This page is trying to load scripts from unauthenticated sources.” Learn more. >the vast majority of data transmitted is actually encrypted using a relatively simple cipher. This last line of the article is very scary. Is this true of things like my banking information? HTTPS is extremely secure. While attacks are possible – see example below – they’re few and far between and it’s not really something you need to worry too much about. The relatively simple cypher doesn’t mean less secure. It means that creating the keys takes a lot more computational power than encrypting or decrypting with those keys. If you’ve ever created PGP keys or other encryption method, you’d have noticed it takes a long time to create those keys. This is true of all HTTPS and should not be considered “scarey” in the least. The WAY the encryption is performed is computationally simple, but the TECHNIQUE that generates the keys used is both complex and very secure. I have heard over and over on major TV network newscasts of the danger of using public Wi-Fi systems in coffee houses, hotels, etc. I understand the danger when communicating with unsecure websites, but what about with https websites? If I am using a hotel Wi-Fi network to communicate with my bank’s https site, am I at risk? I guess it’s typical of how the media go for the sizzle instead of the substance. In several cautionary pieces about public Wi-Fi over the years I have never once heard them mention HTTPS–and I’ve listened carefully. Yeah, it’d make for a less interesting story if they were to point out that all the important transactions – even Facebook logins – are relatively safe (I say “relatively” as nothing can ever be said to be 100% secure). The bottom line is that HTTPS over a public network is no more a less secure than HTTPs over your home network. In “Problem #2” it is stated that “the destination does not use https,” but when clicking on your microsoft.com link (very clever, btw! ), the destination page reads https://store.askleo.com/product/buy-leo-a-latte/ in the address bar. How can, or why, does that https:// appear at the destination if it does not use https? Can that be faked, too? Prices have come WAY down for SSL certificates – they’re no longer “exorbitant”. And I debunked the “extra processing power required” myth explicitly in the article. Probably not. The chances are greater that if a page is resolving to the https version that it will be showing that version the first time anyway.